Brains are not punching bags. They are soft, delicate structures made of 100 Billion nerve cells and 400 miles of blood vessels. No amount of protection around the head can stop the damage when the head suddenly stops and the brain slams against the inside of the skull. When the head is struck or violently jerked or twisted, nerve cells are stretched and sheer apart. What more do we need to know to stop the damage being inflicted on athletes, especially the young ones whose brains are still in critical stages of development into their 20s? Here’s more. In newly published research, investigators studying the donated brains of American football players report evidence of Chronic Traumatic Encephalopathy (CTE) in 87% of players at all levels, and 99% of NFL players. CTE is a degenerative brain disease caused by repeated concussions, and has been seen in autopsies of athletes who engaged in a wide range of contact sports including football, boxing, ice hockey, professional wrestling and rugby. 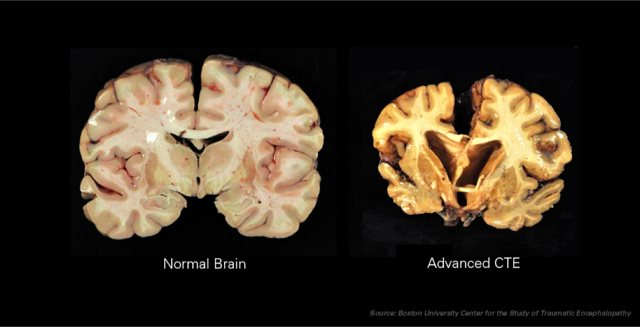 CTE causes loss of brain mass, and shrinking of many areas of the brain critical to memory, emotional control and muscle movement. At the microscopic level, CTE is defined by loss of nerve tissue along with deposition of protein tangles and other cellular abnormalities. Sadly, the symptoms of CTE may not appear for more than 8 years after repetitive concussions and the underlying, progressive damage has been done. The symptoms of CTE begin as attention deficits, “brain fog,” headaches and dizziness. These can be followed by loss of judgement, mood swings and memory loss. Finally, there are tremors, vertigo, loss of muscle control, speech impairments, worsening dementia and thoughts of suicide. It is a personal decision for an adult to expose him or herself to this risk. It is society’s decision whether to promote and profit on sports that have been proved to subject their participants to devastating disabilities. But it is every parent’s decision whether to expose a child to brain damage. Not all concussions lead to CTE, but all concussions can lead to disabling symptoms that emerge weeks to months following the injury. Today’s “Concussions Protocols” do not heal the brain. They attempt to remove the athlete from further damage in the short term while they wait for symptoms to disappear. But, the damage can continue to mount silently for months and years. Any young person suffering a suspected head injury should be evaluated by a medical professional. Hyperbaric Oxygen Therapy (HBOT) should be included in any comprehensive program of medical care for concussion. HBOT has been shown by extensive clinical experience and emerging research to help heal the injured brain. HBOT reduces brain inflammation, stops destructive metabolic processes, and drives neurological and vascular healing. HBOT should be a standard part of medical protocols for athletes of all ages and all levels of play. If pro football players and the NFL want to take the risk, it’s up to them, their owners and sponsors. If young people are to be put at risk, it’s up to their parents.